Manassas Park City Schools is one of many school divisions across the nation that is employing efforts to transform the learning environment in the classroom from books and paper to digital mediums. Today, students entering our school division have already been touched by digital media through the use of a tablet or laptop as an early form of learning and play. By the time many children enter Kindergarten, they have even learned how to use an application on their parent’s cell phone. At the start of our transformation, students and staff members participated in “BYOD” (Bring Your Own Device) at Manassas Park Middle School after rolling out the 1:1 initiative the year before at the high school. This initiative was well received and the first step for MPCS beginning its transformation into the digital media world. The dramatic impact digital media is making on how we work, play and socialize is growing every day. Looking to the near future, MPCS educators understand the need to keep up with the changing world. They are very aware that students today understand and are using the power of digital media in learning and practicing what affects them in the classroom and at home. At the same time, these leaders also recognize the power of digital media as a tool to engage our students in learning in the classroom and beyond. It is easy to understand why new methods or tools are necessary to prepare our students for the future by teaching skills necessary to succeed in college, career, and in life. As we learn about the process of Digital Conversion, it has been necessary to study other school divisions that have been successful in this arena. During our planning process, Manassas Park City Schools chose to study and even visited two well-known school districts that engaged and are successful in digital conversion, Mooresville Graded School District in North Carolina and Baltimore County Public Schools in Maryland. Several teams of MPCS administrators and staff members took what they have learned and used it to help model our digital conversion. The MPCS Connects! team learned that conversion is not to give every teacher and student a device and have them teach and learn on their own, but more important, it is essential to format a careful plan of implementation. This means teachers continue to have specific training in the use of these devices, as well as a planned program that is concurrent with the Standards of Learning that the Virginia Department of Education (VDOE) requires. The Virginia Public School Authority (VPSA) supports the Virginia e-Learning Backpack Initiative and has offered to eligible school divisions the Virginia e-Learning Backpack Initiative Supplemental Grants. This is a matching grant program and as an eligible school division, we received a grant to begin our process. Establish a computer-based instructional and testing system for the SOL; Develop the capability for high speed Internet connectivity at high schools followed by middle schools and then in elementary schools; Administer 100 percent of high school SOL tests online by fiscal year 2011, 100 percent of middle school SOL tests online by fiscal year 2012, and 100 percent of elementary school SOL tests online by fiscal year 2013. MPCS has embraced this goal and has succeeded in implementing these changes. Again, it is very important to note that to achieve successful digital conversion will take several years, many man-hours, and changes to the infrastructure, as well as continued training of staff to be successful. MPCS believes that all children will succeed and this digital conversion will help to prepare them for their future lives and careers. MPCS is now 1:1 with technology for all students in grades 2 - 12 for the 2018-2019 school year. A technology fee of $25 is required as well as completion of the InfoSnap process through the PowerSchool Parent Portal for a device to be issued. Fees can be paid through an online process; MySchoolBucks. Completion of InfoSnap and payment of fees will help expedite the deployment process. Want to speed up the deployment process? Do the following BEFORE you arrive! 2. 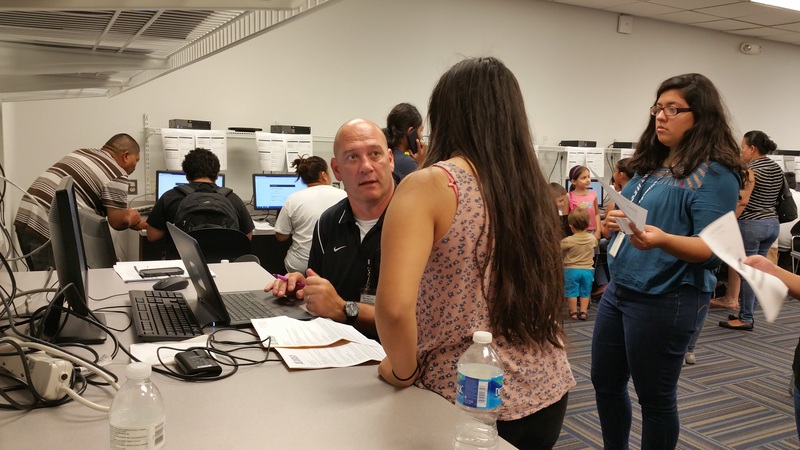 Pay Your Technology Fee(s): Manassas Park City Schools now offers MySchoolBucks. This convenient online payment service provides a quick and easy way to pay for school related purchases. You can now pay for items such as meal payments, technology, field trips, PE uniforms, and more using your credit/debit card or electronic check. All students in grades 2 – 12 will be assigned a technology device for the new school year; the technology fee of $25 for each student can now be paid via MySchoolBucks. Please be sure to bring a copy of your payment receipt to the device deployment. Register for your FREE account today at https://www.MySchoolBucks.com. 3. RETURNING STUDENTS IN GRADES 7 - 12; BRING YOUR MPCS-ISSUED BACKPACK/TABLET SLEEVE WITH YOU! We cannot give you a device without it!